Let’s pick up our in-depth exploration of body fat measurement with a group of volumetric techniques, specifically Hydrostatic Weighing (i.e. dunk tank) and Air Displacement. These methods either directly or indirectly measure your body volume, and then apply the different densities and properties of fat mass and lean mass to calculate your body fat percentage. If any of these terms sound foreign, refer to our introductory post for an explanation. Volumetric methods directly measure the body’s mass (a.k.a. weight) and then use reasonably intuitive methods to measure the body’s volume. Because density equals mass divided by volume (remember middle school science class? 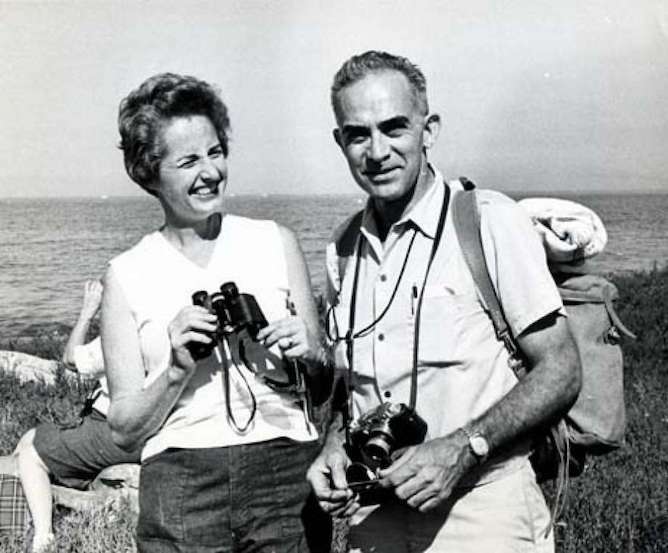 ), it is then possible to obtain the density of the body. Lean mass (or fat-free mass) contains, you guessed it, everything in your body that isn't fat — muscle, bone, brain, organs, etc. — all of which are denser than fat. The common refrain, “muscle weighs more than fat” refers to that fact that any volume of lean mass will weigh more than the same volume of fat. Luckily, we have a relatively accurate estimate of the density of both fat mass and lean mass. Using these known constants, some very smart physicists (like this stud pictured above, William Siri) were able to derive the amount of fat and lean mass from the body’s density. This allows us to estimate your body fat – if we can learn your density. If you want a more comprehensive explanation of the math behind these techniques, take a look at these slides on the derivation of Siri’s equation. Unlike DXA, these volumetric methods are considered to be two compartment methods, meaning they are only able to differentiate between ‘fat’ and ‘everything else.’ Since DXA directly measures bone, it can measure three compartments: ‘bone,’ ‘fat,’ and ‘everything else.’ For the most part this means that DXA is more accurate than volume, but there are some complicating factors, as we learned in the previous post on DXA. For now, let’s get down to the specifics of hydrostatic weighing and air displacement. 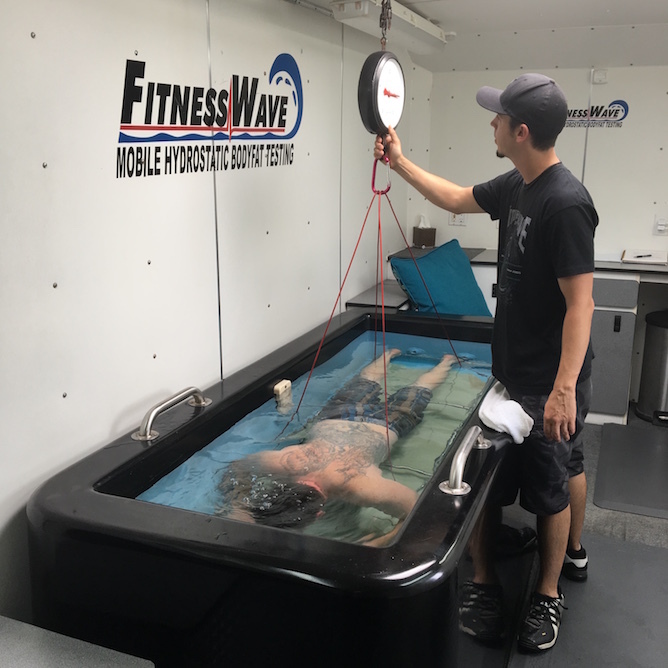 Hydrostatic weighing is commonly referred to as the “dunk tank.” Hydrostatic weighing primarily works by submerging the body into water and obtaining the body’s underwater weight. Why look at underwater weight? Water displacement is the method most often used to measure volume in static objects. That is, if you have a known quantity of water and then place an object inside that water, the volume of the object is equal to the volume of water it displaces. Simple enough, right? Unfortunately, the human body somewhat complicates this approach. It's impossible for your body (or anybody) to remain completely still underwater, making it impossible to directly measure the water displaced with accuracy. So, hydrostatic weighing takes an indirect approach — using your weight underwater to infer your volume. This is based on the "Archimedes Principle" which states that a body’s underwater weight is directly proportional to the volume it displaces. The "dunk" measures your underwater weight, which is used to compute your body's volume. Using that volume estimate and your dry mass (not-underwater weight), we can calculate your density. This is where our good friend William Siri comes in! We can now plug the total density of your body into Siri’s formula — which uses known constants for the density of fat mass and lean mass — to estimate the percentage of your body that is fat mass versus lean mass. Ever heard of a Bod Pod? A Bod Pod is technically an Air Displacement Plethysmograph (ADP). In layman's terms, this means that it uses changes in air pressure to measure the body’s volume. It works similarly to a dunk tank, but rather than using water, the Bod Pod measures changes in air pressure inside an enclosed space to derive your body’s volume. 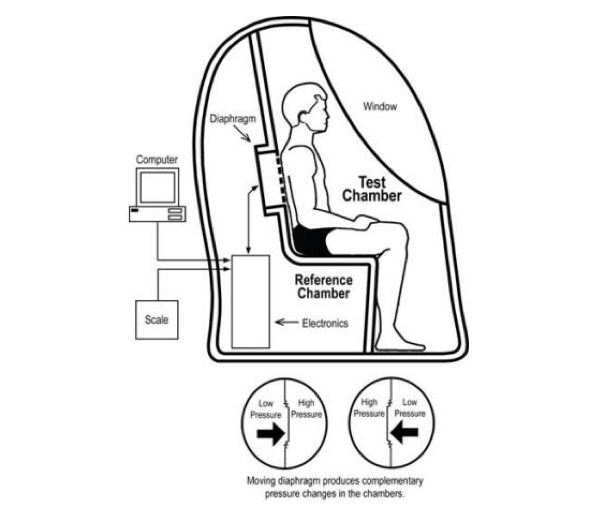 A Bod Pod has two discrete chambers: one with the seat, known as the test chamber, and a separate section known as the reference chamber. The design of this chamber allows air to flow in a very specific manner, so that when pressure increases in the test chamber, it decreases by that exact amount in the reference chamber (the converse it true, too). In order to estimate the body’s volume, air pressure is measured in both chambers without the body present, and then with the body present. The difference between these two? The volume of the body! Then, exactly as in hydrostatic weighing, the body’s mass and volume are used to compute density. Density is then plugged into our Siri equation and voila! We have a two-compartment measure of body composition (body fat percentage, lean mass, and fat mass). Both of these methods are based on sound logic, but there is still some room for error. Both Hydrostatic Weighing and ADP assume a constant density for ALL lean mass. This means that both of these techniques are insensitive to individual differences in body water, body air, and bone density. These values can vary considerably from one person to another, and research has shown that the density of lean mass can change depending on age, gender, and ethnicity. Using one equation (normed for Caucasian males) for all individuals introduces a rather large variability in the accuracy of these measurements. Another source of potential error is the air in our bodies. Some of that air is easy to estimate and correct for (i.e. most people have about 100cc of air in their gastrointestinal tract), while others are less straightforward. In hydrostatic weighing, people are asked to try to expel all the air they can from their lungs. Then, a residual volume of air left in their lungs is usually estimated. In ADP, people are instructed to breathe normally, so an average lung volume during normal breathing is estimated. The estimations may vary slightly from the actual volume, but these values are at least consistent from assessment to assessment. In hydrostatic weighing, there is a more concerning source of variability – user error. It is both very uncomfortable and very difficult to expel all the air from your lungs, and even more difficult to do so consistently from test to test. This makes assessing change over time incredibly difficult, as it’s impossible to know if differences in body composition are due to real differences or just differences in exhalation of air during testing. Similarly, in ADP, any slight movement or change in breathing pattern may affect the results. These movements have the potential to impact body fat assessment even more than user error in Hydrostatic Weighing, thus compromising both the body fat measurement and the ability to capture changes. For both techniques, other factors can affect the body fat measurement, like air bubbles in hair or clothing, excessive facial or body hair, ambient temperature, barometric pressure, and (in hydrostatic weighing) even higher buoyancy associated with higher fat mass. These sources of error tend to cause more problems for ADP compared to Hydrostatic weighing. For both methods, however, these seemingly small factors have the potential to add up! Aeron (the owner of our preferred dunk tank provider) captures a beta tester's underwater weight. Although Aeron has dunked over 30,000 people (! ), there is unfortunately still room for error. So, what’s the verdict on volume? Overall, volumetric methods do reasonably well when it comes to estimating body composition. When compared to medical-grade assessments that directly measure body fat, bone, total body water, and lung volume, volumetric methods across the population are accurate +/-2%. On average, volumetric methods predict lower body fat than methods that incorporate more than two compartments. Now, just because the population-level error is 2%, it doesn’t mean the error is 2% for all people. Some individuals will have volume-based body fat measurements identical to their DXA or other multi-compartment models, while others may error rates up to 5-6% in Hydrostatic Weighing and as high as 10% in ADP. That said, a much of the individual variability is likely due to differences in bone and muscle density across different races, ages and genders. Thus, it’s highly likely that if we derive race-, gender-, and age-specific body fat equations, this individual error will decrease. When it comes to tracking change over time, Hydrostatic Weighing, used correctly, outperforms ADP and does about as well as DXA, but it is not perfectly correlated with a higher compartment model. If you’re planning on tracking change using this method, you’d be best served by always getting tested at the same time of day, wearing the same clothing, and following the same eating/drinking regimen in the few days prior. At $40-$60 per assessment, these volume-based methods are also somewhat cheaper and more accessible than DXA. ADP is most often used in academic settings, but Hydrostatic Weighing is rapidly becoming more commercially available thanks to dunk tank trucks! All that said, regular users will also tell you that Hydrostatic Weighing is neither the easiest nor the most comfortable experience, which can dissuade users from regular testing, making it difficult to reliably detect change over time. Volumetric methods are not perfect – remember, they don’t really “measure” body fat directly — but, at the population level, they estimate it quite well. Though on a person-by-person basis, the accuracy is more limited. But, as you’ll soon see, these methods do considerably better than most common common ones, like impedance scales and caliper tests. Stay tuned!